Hit the Ground Running: Victory! Saturday at 8:30am, my confidence was fully restored. I rolled out of bed at 4:15 and had a poptart and Caramel Macchiato flavored Gu, the pre-LSD breakfast of champions. I was out the door and into the pleasant 71-degree morning by 5:15. The guys at Fit2Run were like, "Uh...stocking up?" I got two of each so Matt and I could both try them. Caramel Macchiato is my new favorite flavor. It's not too sweet and has a nice coffee-flavored kick. My plan was to run my parents' neighborhood three times. The main road is a 3-mile loop with one offshoot that adds two more miles. 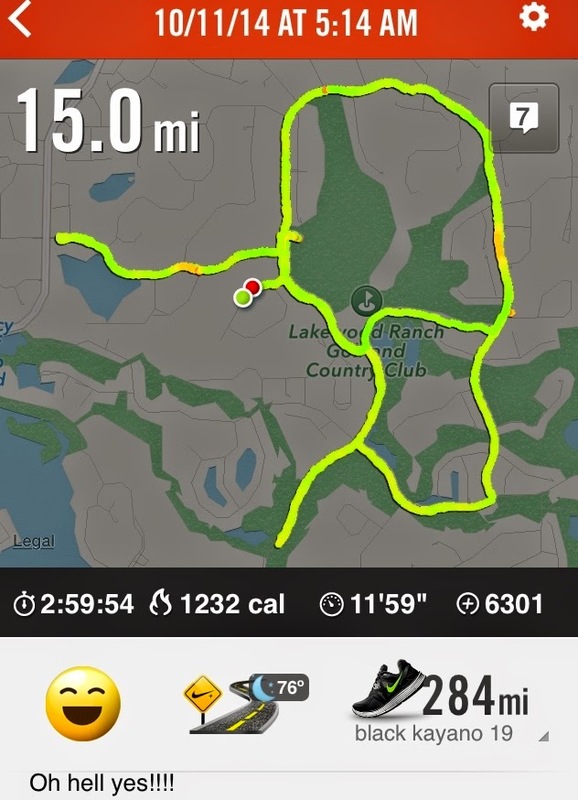 I wanted to be done by 8:30 so I could make it to Matt's race in time to see him finish, so I was aiming to complete15-16 miles in three hours. I ran the first five miles without any music; it was just me and the wild that is the golf course. There were quite a few frogs, but most of the creatures out at that time were of the silent variety; I saw bats, deer, and a bobcat. A mama and fawn stopped grazing to watch me pass. At mile 5.5 I paused for Gu (Peanut Butter this time) and water, then went back home to use the bathroom. It was my one and only "pause" on this run. I was beyond happy that I was able to run basically the entire thing. My paces were so consistent, I couldn't have been happier. I took the same loop backward for the second round. There are two water stations right near the sidewalk and I paused once along each repeat for a sip, and snacked on Lifesavers as I went. Sandhill cranes taking a leisurely stroll. 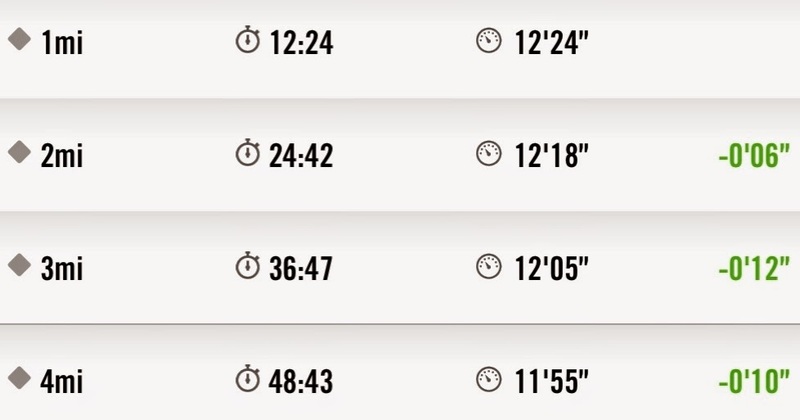 By the time I finished the second loop I was bored and didn't want to have to cover that one random offshoot a third time, so I turned into a subdivision and ran two miles there, then completed the 3-mile loop one more time. By the end it was starting to warm up, but I was filled with confidence. I knew there was no way I'd fail to finish this long run, and in the three hours I had planned! The last mile was my fastest and included the one big hill on the run! 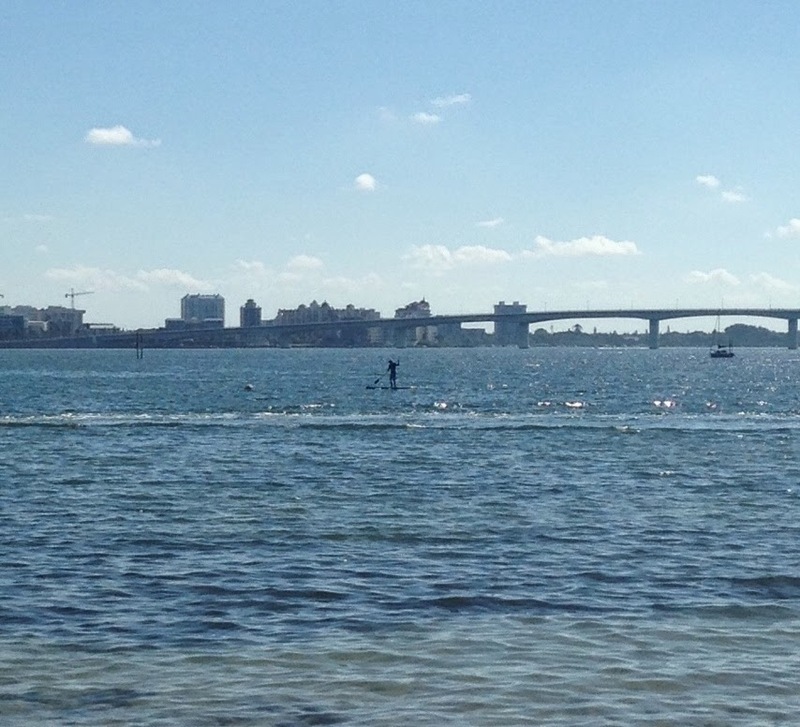 I cleaned up and drove to Matt's 10k SUP race; I got there with plenty of time to see him finish. Matt coming in toward the end. 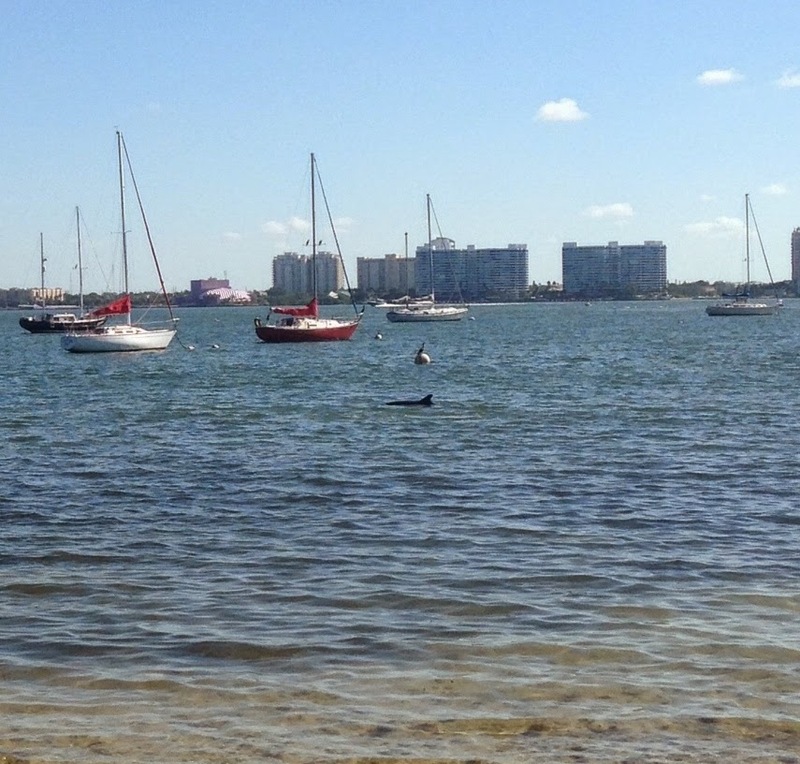 There were two dolphins playing right near the last quarter mile. I had literally no pain post-run except in my right kneecap, but it was gone by the next morning. Considering this was the distance that left me injured last year, I'm pretty excited that this year 15 miles can go in the books as a success. Beast mode: on. Training: full speed ahead! Yes!!! I am so glad you had such a strong run. Did you really see bobcat? Are they dangerous? Apparently they're quite common in my parents' neighborhood. Phew as about 20 meters away in e middle of the road and skunk into a bush when he saw me. I have no clue if they're dangerous but they're smaller than I expected! He was more scared of me than I was of him, I think. He froze, then took off into the bushes as soon as he saw me! 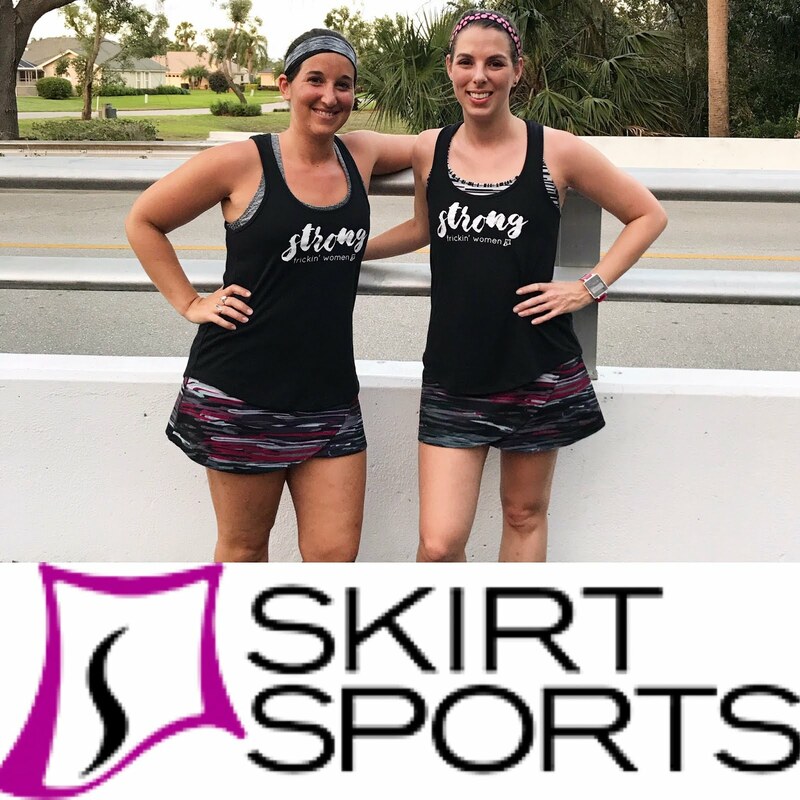 Congrats on the great run - just look at those awesome splits! Way to pick it up for the last mile! I wish I saw interesting animals during my runs, but I rarely ever even see squirrels! We do have peacocks that roam around occasionally which is pretty cool, but I only see them maybe twice a year. Ooh peacocks might scare me! They're big! Are they aggressive? Hooray for your long run!!!! Please send me some of those Caramel Macchiato Gu's!!!! ;) I have never seen those here in Canada. The 'plain' Gu you saw on my blog may have actually been Vanilla Bean? All my Gu's were flavoured so I figured that's the one you saw. :) I can't believe you saw a Bobcat! Weren't you terrified? I would 100% send you some Gu if I had your address :o) I must have seen the vanilla, which was the first Gu I tried and it made my stomach hurt. The bobcat made me nervous, but once I passed him I forgot all about him! YAHOO!!! It's amazing how a great run boosts our confidence....you've got this!!! Congrat's to Matt as well!!! You guys are so supportive of eachother and I love it! It's definitely what makes us work! I had to tell him that exact thing last week...our support of each other's passions is what makes us work so well! Congrats on a great run!!! I normally only see deer and turtles on my runs. Aw, I love turtles!! I never get to see them on a run though; we usually see them driving and have to stop to pick them up out of the road.